This adorable little pewter kitty cat would make a purrrfect gift. 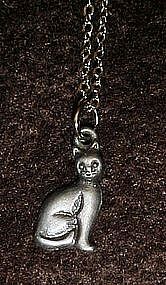 Little kitty measures just 3/4" long and comes with a nice little 18" chain.Great detailing. Like new condition!